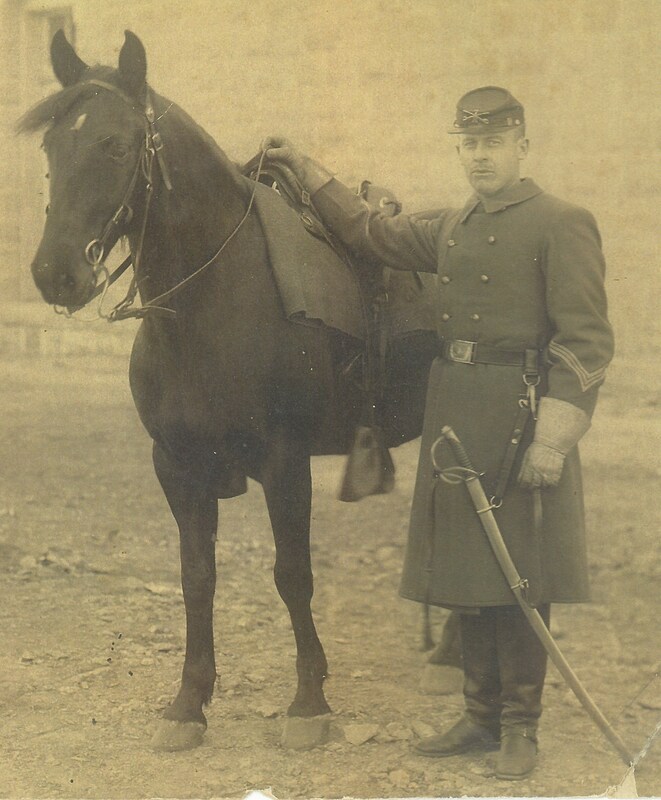 Sergeant Alvin H. Haselwood, A Troop, 7th Cavalry, with his mount, likely at Fort Riley, Kansas, circa 1890. Captain Myles Moylan’s Troop A suffered five soldiers killed in action and six wounded in action at Wounded Knee, one of whom died of wounds the following day at Pine Ridge. The dead included Sergeant Arthur C. Dyer shot in the chest, and Saddler Henry Frey and Privates George P. Johnson, James Logan, and Michael Regan, all of gunshots to the head. Private Herman Granberg died of his wounds the following day and was, according to Dr. Charles Ewing’s account, shot to pieces. The other five wounded included Lieutenant Ernest A. Garlington shot in the right arm, Private Harry L. Duncan of a pistol wound to his face, Private Daniel McMahon with a gunshot to his right foot, Private Adam Neder of a gunshot wound to his right shoulder, and Sergeant Alvin H. Haselwood who suffered multiple gunshot wounds to his left thigh and his left arm above and below his elbow. Haselwood ultimately became the final death of the campaign. The Inventory of Effects of Sergeant Haselwood includes a notation indicating that all of the effects were turned over to his brother, W. K. Haselwood, on 13 March 1891. In early January 1891, all of the wounded that were stable enough to be moved by wagon and rail were transported to Fort Riley, Haselwood among them. He likely never left the hospital, as he contracted influenza and eventually died of pneumonia on 11 March. The entry on the post Burial Register and on his Final Statement make no mention of his death being connected to his wounds. However, his comrades clearly considered Sergeant Haselwood’s demise as a direct course of his gunshot wounds suffered during that winter’s campaign, as they included his name on the Wounded Knee Memorial as one of the killed. Born in March 1862 in Grant County, Kentucky, Alvin H. Haselwood was the eleventh child of Thomas A. and Frances Ann (Dance) Haselwood. His mother, the daughter of John and Rebecca (Brann) Dance, died later that same year at the age of forty-one. Three years later Alvin’s father married Margaret Stone, with whom he had three more children. By the age of eighteen, Alvin Haselwood was living on his own. He made his way to Cincinnati, Ohio where he enlisted for five years on 12 December 1881. He listed his occupation as that of his father, a farmer. Standing over five feet seven inches tall, he had blue eyes, light hair, and a fair complexion. Haselwood was initially assigned to H Troop and later transferred to Captain Moylan’s A Troop. He finished out his term of enlistment as a Private at the end of 1886 at Fort Keogh in the Montana territory and reenlisted for another five years. He remained with A Troop eventually gaining sergeant stripes by the time his unit arrived at Wounded Knee in late December 1891. The above article appeared in the Junction City Weekly Union on 21 March 1891. Two days after his death at Fort Riley, Sergeant Alvin Haselwood’s oldest brother, William, signed for his brother’s personal effects. William K. Haselwood was twenty-two years older than his brother, Alvin, and was a veteran of the Civil War having served as a captain and commander of D Company, 50th Illinois Infantry Regiment. 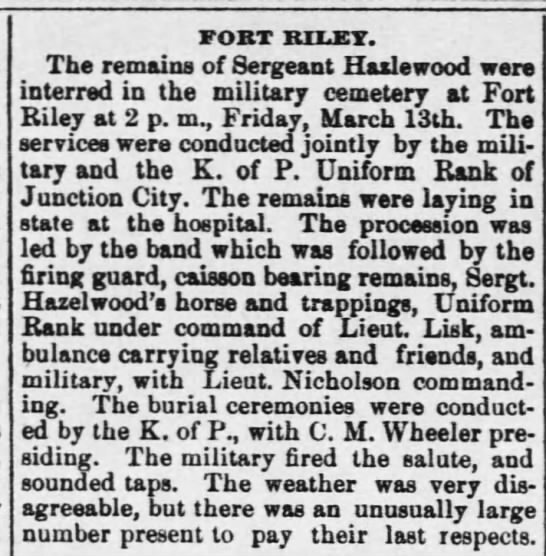 While at Fort Riley, he likely attended Sergeant Haselwood’s funeral at the Fort Riley Post Cemetery. 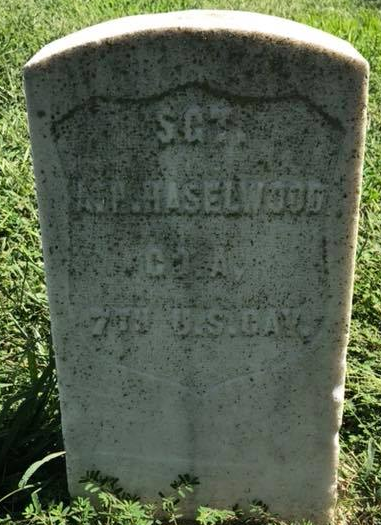 Sergeant Alvin H. Haselwood, A Troop, 7th Cavalry, is buried in the Fort Riley Post Cemetery. Judy Roatcap-Haselwood, “Sgt Alvin H. Haselwood,” FindAGrave, http://www.findagrave.com/cgi-bin/fg.cgi?page=gr&GRid=115679424 accessed 24 Oct 2013. Adjutant General’s Officer, “7th Cavalry, Troop A, Jan. 1885 – Dec. 1897,” Muster Rolls of Regular Army Organizations, 1784 – Oct. 31, 1912, Record Group 94, (Washington: National Archives Record Administration). National Archives and Records Administration, Burial Registers of Military Posts and National Cemeteries, compiled ca. 1862-ca. 1960, Archive Number: 44778151, Series: A1 627, Record Group Title: Records of the Office of the Quartermaster General, 1774-1985, Record Group Number: 92; Associated Press,”Wounded Knee Heroes,” Abilene Weekly Reflector, X (48) (1893, July 27), p. 5; Adjutant General’s Office, Final Statements, 1862-1899, “Haselwood, Alvin H.,” at Fold3, http://www.fold3.com/image/271303557/ accessed 15 Oct 2013. 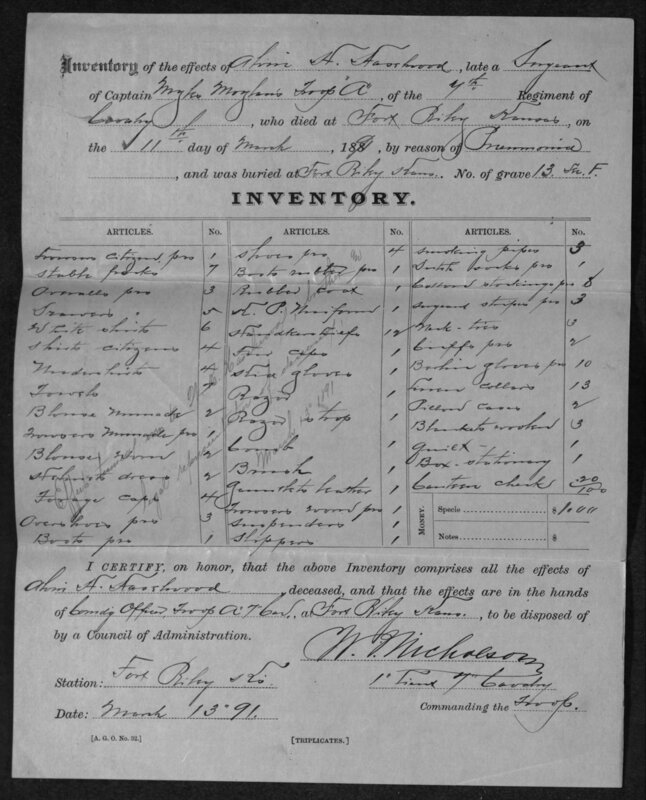 Ancestry.com, 1860 United States Federal Census [database on-line], Provo, UT, USA: Ancestry.com Operations, Inc., 2009, Year: 1860, Census Place: Grant, Kentucky, Roll: M653_368, Page: 827, Image: 311, Family History Library Film: 803368; Year: 1870, Census Place: Cordova, Grant, Kentucky, Roll: M593_463, Page: 494A, Image: 293, Family History Library Film: 545962. Adjutant General’s Office, Final Statements, 1862-1899, “Haselwood, Alvin H.,” at Fold3, http://www.fold3.com/image/271303557/ accessed 15 Oct 2013; Historical Data Systems, comp., American Civil War Soldiers [database on-line], Provo, UT, USA: Ancestry.com Operations Inc, 1999, Side served: Union, State served: Illinois, Enlistment date: 12 Sep 1861. Citation for this article: Samuel L. Russell, “Sergeant Alvin H. Haselwood, A Troop, 7th Cavalry – Last to Die of Wounds,” Army at Wounded Knee, posted 15 Oct 2013, accessed date __________, http://wp.me/p3NoJy-ds. This entry was posted in Casualties, Enlisted and tagged 1891, 7th Cavalry, 7th Cavalry Regiment (United States), Big Foot, Cavalry, Fort Riley, Lakota, Miniconjou, Oglala Lakota, Pine Ridge, Pine Ridge Agency, Pine Ridge Indian Reservation, Sioux, Wounded Knee, Wounded Knee Creek, Wounded Knee Massacre. Bookmark the permalink.